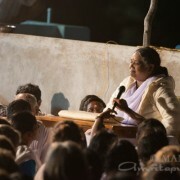 Amma responded, “Don’t feel sad that you were not let inside the Temple. 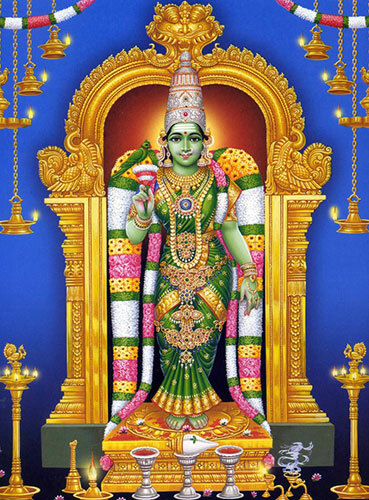 “Meenakshi is the Atma Tatwam, and it was because of your innocence and devotion that you got this experience. Daughter! Though the Temple doors were closed for you, if the doors of the heart are open, Devi will get revealed from within. Isn’t your experience a proof of this? Amma went on to explain the reason behind why some of Temples don’t let non- Hindus inside. 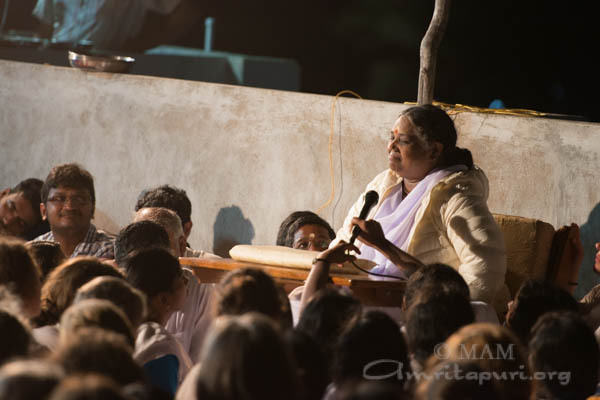 Amma said, “There are many reasons. If non-devotees are let inside the Temple, they might not respect the sanctity of the Temple. They might spit or they might enter into the Temple with shoes on – making the premises dirty. In countries like Japan they use different shoes indoors. The shoe used outdoors is not used inside the house. The same is true with certain hotels as well. Just as we have different etiquettes in different places, Temples too have their own etiquettes. Non-devotees might not respect those etiquettes. 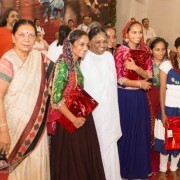 If etiquettes are broken, that might affect the sanctity of the Temple and certain long purification rituals need to be done to restore the sanctity. “The Temples that are consecrated by ordinary people can be compared to fish in a fish tank. One needs to feed the fish, replace the water regularly, and the tank needs regular maintenance. Similarly regular pooja and rituals are needed to maintain the sanctity of those Temples. However, Temples consecrated by Mahatmas can be likened to fish in the ocean – fish in the ocean don’t need any human support. Similarly, the sanctity of such Temples doesn’t get affected. “Actually, Temples such as Meenakshi’s were consecrated by Mahatmas. Still, they follow strict etiquettes because the Temple was invaded by Muslim rulers multiple times. The wealth was plundered. Many idols were disfigured by the attackers. They cut off the hands, noses and breasts of the idols. For more than 60 years the main idol in the Meenakshi Temple was kept hidden to protect it from the attackers. Even British and invaders from other nations have looted idols of many Temples. Maybe it is because of this that they don’t let non-Hindus into some Temples. 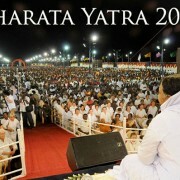 However, Hindus and devotees who know spiritual principles might follow the etiquettes will fully. That is why they are allowed. 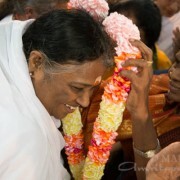 “Many years ago, when Amma visited the Guruvayoor Temple, western daughters who were dressed in saris were let in. “Actually, God doesn’t need any protection from human beings. The power of the Prime Minister is much more than (above) the security guards and the police who give protection to him. Though the Prime Minister is far superior, it is the responsibility of the security guards to guard the Prime Minister. Similarly, it is the responsibility of the devotees to protect the Temple from attackers.